Sometime ago, I came across a word that fixed and erased a lot of issues I had for years. This will help you, maybe your kid or someone you know. It is called: Multipotentiality. The state of having many exceptional talents, any one or more of which could make for a great career for that person. Gifted children often (though of course not always) have multipotentiality. Their advanced intellectual abilities and their intense curiosity make them prime candidates for excelling in multiple areas. A while back, I wrote about My Aha Moment and How I Reached The Tipping Point. The interviewer couldn’t understand how one person could do many things (and do them well). That moment showed me that things people think are negative about your professional life are somewhat God-given and lead to your freedom. As a youth, I believed (and was taught by the world) that I had to choose only one direction. In fact, I wanted to be many things – lawyer, economist, dancer, movie star, news anchor, fashion designer, professor, entrepreneur, talk show host, diplomat, plus more. One thing I didn’t have on my list was preacher, lol! The Lord surely knows how to pick ’em! There were times when it felt like I should just focus on one thing because that’s what normal people do – they just do one thing – maybe teach, be a doctor, accountant, lawyer, etc until they retire. However, I never really saw myself like that. I saw myself as one who could (and can) do many things and excel at them too – a multipotentialite. My gifts and talents are multiple, so why should I choose one and be miserable? The negative connotation of a multipotentialite (or polymath) is that he or she is a confused person that cannot focus on one thing; perhaps tagged a jack of all trades. There’s the possibility of being bored easily but that is usually overcome by constantly and boldly learning new things. Diversity of intellectual playgrounds breeds confidence instead of fear of the unknown. It also breeds empathy with the broadest range of human conditions and appreciation of the broadest range of human accomplishments. Who cares about multipotentiality and why do you need to know about it? If you are a multipotentialite, refuse to choose. Instead embrace the gifts that God has given you. Yes, I do many things. I am a privacy and data protection consultant (which fits well with my legal and IT expertise). I help corporations become and remain compliant with privacy regulations like FTC and HIPAA. I am a Christian book publisher. I am a writer and founder of iStartandFinish.com, where I write across multiple disciplines. I am a pastor who is responsible for equipping God’s people for works of service so that the body of Christ may be built up. I am a purpose activator, life and business strategist, an empowerment speaker who is passionate about helping people start, run, finish and win. I am the blessed mom of three wonderful kids and wife of an educator (who is also a preacher). Wait a minute..that’s not all. Now and again, I use my tech development programming skills to build a website or two or three (like this one you are reading right now). And that’s still not all. “I can do all things through Christ who strengthens me” (Phil 4:13). Literally. Enough already with labels and titles. I am just me, Belinda – fearfully and wonderfully made, beloved daughter of the Most High God, a product of the King. I love people. I help people and that is why everything I do and know how to do falls under iStartandFinish.com. No matter what you do or where you are, there’s a START button in your life with lots of in-betweens and a FINISH button. Those in-betweens can make or break an individual or corporation. That’s where I come in with my brand, iStartandFinish. I help people in diverse ways to run this human race and finish strong. Know and understand that you are important. Be yourself. You are blessed and highly favored by God. Don’t allow anyone to put you in a box or define you. Just be you. I have seen medical doctors who are professional artistes and movie producers. I have seen lawyers who are professional musicians. I have seen pastors who are successful entrepreneurs, don’t take a salary from the church, are New York Times best-selling authors, real estate moguls, movie producers, song writers, lawyers, medical doctors..(and the list goes on). It’s okay to be multi-talented and be a multipotentialite. If your kid, nephew or niece or someone you know fits this description, encourage him or her to excel in all things. Want to know some notable multipotentialites? Check out Leonardo Davinci (he was a polymath – painter, sculptor, architect, musician, mathematician, engineer, inventor, anatomist, geologist, cartographer, botanist, and writer); Oprah, Benjamin Franklin (one of the founding fathers of the United States was a leading author, printer, political theorist, politician, postmaster, scientist, musician, inventor, satirist, civic activist, statesman, and diplomat); Tim Ferris, Maya Angelou (singer, composer, poet, civil rights worker, movie director, journalist, dancer, Reynolds Professor of American Studies), TD Jakes, Aristotle, eh moi (amen and amen, praise the Lord). Question: Are you a multipotentialite or do you know someone who is gifted in many things? What did you say you wanted to be when you grew up? Thank you for this message. It has greatly touched me. Indeed, this is what and who I am. However, i did not realise it this way. I used to wonder why is it that i am drifting from one thing to another. A lot is now clearer. I will begin to embrace and appreciate who I am to the glory of God. No more trying to fit myself into a box when i need a bigger box. Praise be to God. Yes, i can do all things through Christ Jesus. Amen. Belinda, this…this is the story of my life. You would not believe how I happened upon this post on your site. I’m following Tim Ferris on twitter. He retweeted a positive review someone gave of his book, 4 hour work week (a friend recommended his books for me, haven’t had a chance to read them, but seeing you quote him here is re-encouraging me to give them a try! ), I follow the link he retweeted. The author of that post mentions a word I have never heard of before; “multipotentialite”, I google the word, and then your post comes up! 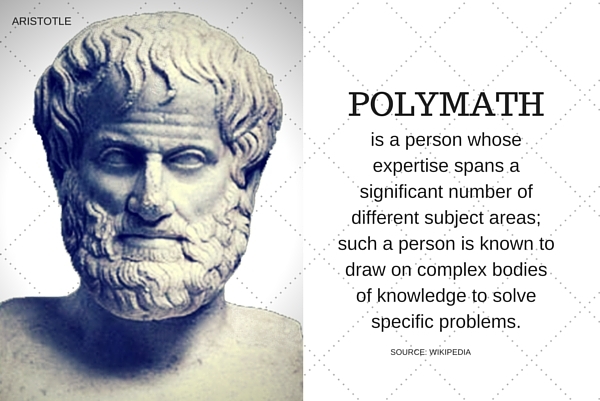 You see, I too believe I am a polymath. One of the folks I admire for his business accomplishments is Richard Branson, simply because he dips his hands into various fields, and doesn’t restrict himself to one avenue. I “studied” computer science for my undergrads, I use the word “study” sparringly cause I never really studied per se and so never really loved the field. What had my interest at a particular time though was film making, I was and still am intrigued by the genius behind it. I applied to study that in a school in Canada but plans fell through, so I am right now studying Info Systems security management! Which is coincidentally kinda related to one of the things you do! I don’t particularly love the course, because I don’t see a purpose to it that really catches my interest. I don’t get a clear answer to the question “why am I studying this?”. Simultaneously, I work at a library in school (and dance while shelving books between book shelves), I write film-related posts for a site in Nigeria, I love public speaking because I used to be SO afraid of it, I must record one music album before I die, and a movie, and I live by faith in Jesus as my Christ. So yes, I am a multipotentialite, but I struggle with exploring the several potentials within me, all the while refusing to conform to people’s standards of doing 1 thing only. I am gradually getting a steady feet on the matter, but I can use all the help I can get, most especially help that comes from the Lord. So thanks for this post, I have subscribed to your site already, and cheers to living the abundant life Christ died for us to live! I already replied your comment but for some very weird reason it’s not appearing here. Anyway, nice to see you here Toonna! Thanks for subscribing and for your encouraging words. I got your powerful voice message. One thing I’ve learned in life is that no experience is wasted. At some point, you will use all you have learned and gained. Society is great at placing labels on people. However, it’s up to the person to accept it. Be you ~ that’s the best thing you can do for you. I welcome you here and look forward to hearing more from you. I am standing tall here! I had been told the same things, “you can’t master all of it”, “you have to pick one”, you know the “jack of all trades, master of none” scare. But yes you can! The key for Multipotentialites is partnerships! If you feel you may be worn out doing it all, partner up with other people and get more done. I decided I will be everything GOD has put in me, He gave me those desires for a reason. If He didn’t choose why should I? After all I am the daughter of my Father ????. Great & timely post! Thanks TI! If God didn’t think there was use for all our gifts and talents, He wouldn’t have given them to us. So, we must go forth and be everything He created us to be. God bless you! Thanks, this is now clear , I am also very dyslexic, but defectively Polymath, I now found the box I was looking for. Thank you so much for sharing. God has blessed me with multiple gifts and i’ve always struggled with focusing on just one. I didn’t want to be looked at as a “jack of all trades – master of none” lol!! I feel like I’ve wasted sooo much time trying to figure life out. I am just starting to embrace who I am. I am a multipotentialite and proud to be one. Blessings! You are welcome Tytenisha! I’m glad you enjoyed reading it. Yes, we must totally embrace who we are and use all the gifts God has given us. I believe you will find my post about my Aha moment and how I reached the tipping point interesting too.